TOKYO, JAPAN, May 8, 2017 – AMRO Director Dr Junhong Chang delivered the keynote speech at the seminar “Economic Development and Financial Stability in Asia”, hosted by the Global Leader Program for Social Design and Management at Tokyo University on May 8, 2017, and spoke on the importance of regional financial safety net for the ASEAN+3 region to sustain growth momentum while maintaining financial stability. 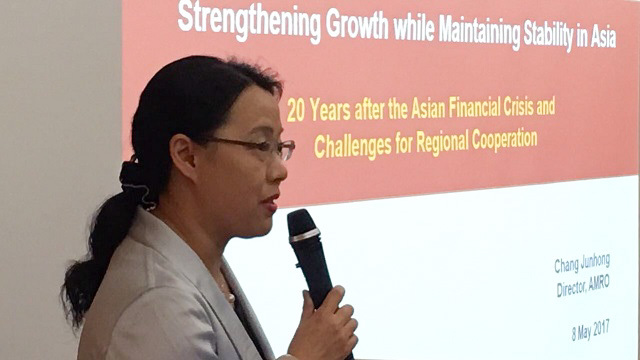 In the speech, Dr Chang introduced to the audience the regional financial safety for ASEAN+3 members (CMIM and AMRO), shared the result of recent thematic study of the region 20 years after the Asian Financial Crisis (AFC) together with AMRO’s growth outlook in 2017 and 2018, and then concluded with a shared vision for regional financial cooperation. This year marks 20 years after the Asian Financial Crisis (AFC), a landmark event in the ASEAN+3 region that has shaped the subsequent foundations and trajectory of economic growth and regional integration, as well as policymakers’ perspectives on crisis management and resolution. The region’s continued openness to trade, FDI and capital flows after the AFC enabled economies—especially the developing ASEAN economies—to reap the benefits of growing regional integration and the emergence of China in regional trade and FDI in the decade following the Global Financial Crisis (GFC), even when the tailwinds provided by global external demand came to an abrupt halt in the advanced economies of the U.S. and Eurozone. Regional financial flows also increased, with Japan continuing its role as a major lender and investor in the ASEAN+3 region. In particular, the AFC highlighted the urgent need for regional financial cooperation in crisis management and resolution, which resulted in the Chiang Mai Initiative under the ASEAN+3 financial cooperation process, its subsequent development into the Chiang Mai Initiative Multilateralisation (CMIM) Agreement, and the creation of AMRO as an independent macroeconomic surveillance unit supporting the CMIM. “While the CMIM was never used so far, it should be emphasized that policymakers’ affirmation of their commitment to regional financial cooperation has helped anchor market expectations and provide a solid policy basis for the region’s continued growth and development in the past two decades,” said Dr Chang. Among the multiple layers of global financial safety nets (GFSN) –consisting of domesic foreign reserves, bilateral swaps, regional financial arrangements (RFAs) and the IMF, the importance of RFAs should not be undervalued, as foreign reserves are costly; bilateral swaps are more likely bound by domestic mandates; and IMF facilities have not been sufficient in bailing out countries that had financial crises recently..
That said, it is true that RFAs have their own limitations and problems: RFAs’ own amount in some cases may not be sufficient to cover region-wide crises. As economies and capital flows keep growing, RFAs may need to upgrade themselves to catch up the trend. If the negative financial contagion spread region-wide, there might be little room for RFAs to play an important role. In this regard, the ASEAN+3 authorities are currently discussing how to strengthen the system in their 5-year periodic review. With an uncertain trade outlook, economic growth in the region will continue to be driven primarily by domestic demand, with support from monetary and fiscal policy. Growth in China and Japan is expected to remain stable in 2017, with downside risks from rising U.S. trade protectionism. Their growth will anchor growth in the ASEAN+3 region, which is expected to slow slightly to around 5.2 and 5.1 percent in 2017 and 2018 respectively. “Going forward, for the regional economies to continue to prosper in the coming decade, it is important for policymakers in the region to strengthen their collective efforts to speed up regional economic and financial integration while further enhancing the CMIM and AMRO,” said Dr Chang.